Quang Nam (VNA) — Two animal inspection stations were established on March 20 on the National Highway No 1 section in Nui Thanh district of Quang Nam central province to control pig transportation from northern provinces and cities. The move aims to control the spread of African swine fever, which has been reported in 20 provinces and cities so far. Pham Bao Hoai, head of the animal inspection station in the north of Quang Nam province said the number of transported pigs, types of pigs and their hygiene on each vehicle would be checked. Vehicles without legal documents and those who can’t show the origin of the pigs would be punished. Officers will spray disinfectants on pigs of unknown origin, he said. The disease was spread from the north and has reached the central province of Thua Thien-Hue. Quang Nam has 500,000 pigs being raised, mostly in small-scale farms. The provincial People’s Committee has ordered local Department of Agriculture and Rural Development to test pigs raised in big farms, slaughterhouses and on pigs suspected of being infected with the virus. According to Nguyen Thanh Nam, head of the provincial sub-department of livestock production and veterinary, the unit has taken samples of 21 dead pigs and has not found any signs of African swine fever. In other central and southern provinces and cities, pig inspections have been carried out to prevent further spread of the fever. 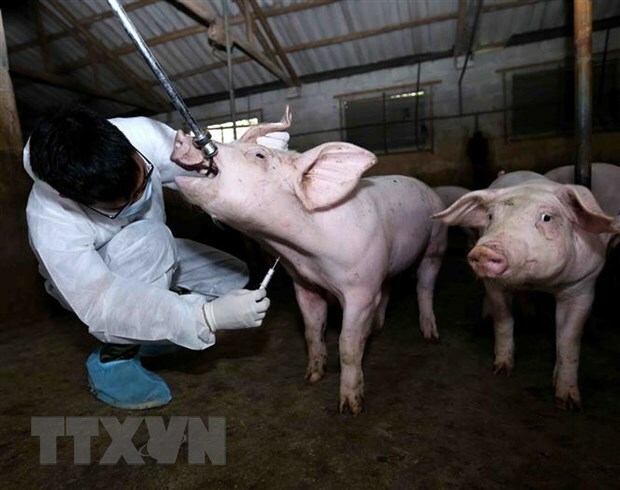 Tran Thi Tai, deputy head of Da Nang city’s sub-department of livestock production and veterinary, said the unit had stepped up inspections, ordered clean-ups of slaughterhouses and sprayed disinfectant around sewers, pig farms and wastewater treatment facilities. A representative of the agricultural sector of southern Binh Phuoc province said inspections had been tightened at border gates and roads on vehicles from affected countries. In the southern province of Dong Nai, one of the biggest pig-raising areas in the country with more than 2.5 pigs, local authorities have set up a steering committee on African swine fever prevention and control.